« Fresh Local Homegrown Garlic! Our Annual Sale starts TODAY! 20% OFF* everything in the store! Don’t miss out; the sale happens only once a year! *All sales final. Discounts will not be applied to prior purchases. Take 20% off anything in the store that is not already on sale! Sale does not include classes, gift certificates, or knife sharpening. *no other discounts apply, all sales final. to receive an extra 5% discount on any single item* valid during our Annual Sale! 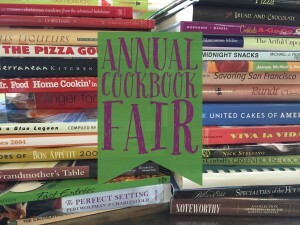 All of the trade-in cookbooks are available for purchase starting at 25 cents! Many of our customers love to browse the cookbook collection, which changes every day during our Annual Sale.